Beach Special! Book now for Spring / Summer 2019! 7-Night Min! New, fully covered upstairs deck / porch, and new added rear deck with stairway access to backyard. Please plan now for your 2019 Spring / Summer Getaway time! And Autumn 2019 weeks are available at discounted rates!! Nicely renovated three bedroom two bath private home with covered front upstairs deck makes for spacious and accommodating vacation getaway! Central air conditioning and fenced property! Wonderful beachside location on tree-lined East Beech Street is short walk to brand new boardwalk and ocean beach, restaurants and shops, and LIRR. Includes spacious front covered 2nd floor porch. Off-street parking. Central air conditioned. Bedding, towels, utensils, wireless internet, cable. Ceiling fans in living room and all bedrooms. Main living area is on the second floor, up one interior staircase. Features:: New granite / stainless kitchen. Inviting open floor plan. Hardwood. Cable. Wireless internet. New living room furniture. Central air conditioned. Stainless grill. Room to store bikes, and bikes available on premises. Driveway parking (for one vehicle, and a second on the street). Fully furnished. Fully equipped: utensils, cookware,bedding, beach passes, beach chairs, umbrella. Please no smoking inside. Please no pets; no exceptions. Availability / See rates field for Cost:: Reserve now for the 2018 late Summer and Autumn season!! Off-season multiple weeks and monthly rates significantly discounted. Care and Maintenance: Guests will find the unit clean and well appointed. Guests are responsible for reasonable care of the unit and its furnishings and amenities. Main living area is up one interior staircase. I stayed at Michael's house with my husband, two boys and parents for a family wedding. We were all very comfortable and truly enjoyed our stay. Close to everything. Have two decks was a bonus. Everything was really perfect and Michael was a great host. We will definitely book again when visiting family in the area. The house is in beautiful condition and in a great location. Michael has everything covered, including sheets, towels, soap and shampoo, so you don't have to worry about anything. The house is bright, air conditioned, and there are ceiling fans in every room, so everyone was comfortable. We're definitely coming back. I visited this property in July 2015 and stayed for a week with my wife and two teenage sons 19 & 16. We travelled from Norwich, in the UK, and came in via JFK which was a simple 30 minute cab ride from the property. Michael, (whose home this is for part of the year), had dealt with our booking very efficiently before we arrived, and was there to meet us when we got out of the cab. The place was exactly as described in the listing and clean and tidy throughout. We got a very useful briefing from Michael about the house, plus some tips about Long Beach and its facilities, and were then left to enjoy our stay. Not surprisingly, the property has a really home from home feel about it, with everything you need right there. The kitchen appliances are all fairly new, there is a big refrigerator with an ice maker, a grill on the front deck (balcony), central a/c, good sound system; wide screen TV and a cable package with more channels than even two teenagers were capable of consuming! The apartment is all on one level one floor up, the master en suite bedroom and two further bedrooms plus a bathroom are all to the rear of the property, with the living areas all facing towards the front. The living area is entirely open plan, arranged in a horse shoe shape around the top of the stairs up from the front door. This makes for a really sociable space in which to cook, eat or just relax, and we were always glad to get back there after busy days seeing the sights up in Manhattan. We had plenty of space for the 4 of us, (it could easily accommodate 6), and were very comfortable there throughout our stay. East Beech Street is a quiet, residential, neighbourhood perfectly located between the beach and the main commercial area up on Park Ave. A 5 minute walk in one direction gets you across the now fully restored 2 mile long boardwalk and down onto the beautifully clean sandy beach, while a 15 minute walk in the other direction has you sitting on a train to Manhattan. As planned we managed to do the whole week without hiring a car. 5 of us travelled from Wales in the UK on May 30th for a two week stay and we were delighted! We had all spent time in NYC previously but on this holiday we wanted to combine the beach and city and not drive. Michael was a joy to work with and was there to meet us after our long journey (we left home at 7pm on May 29th!) the house was perfect everything you need plus some. 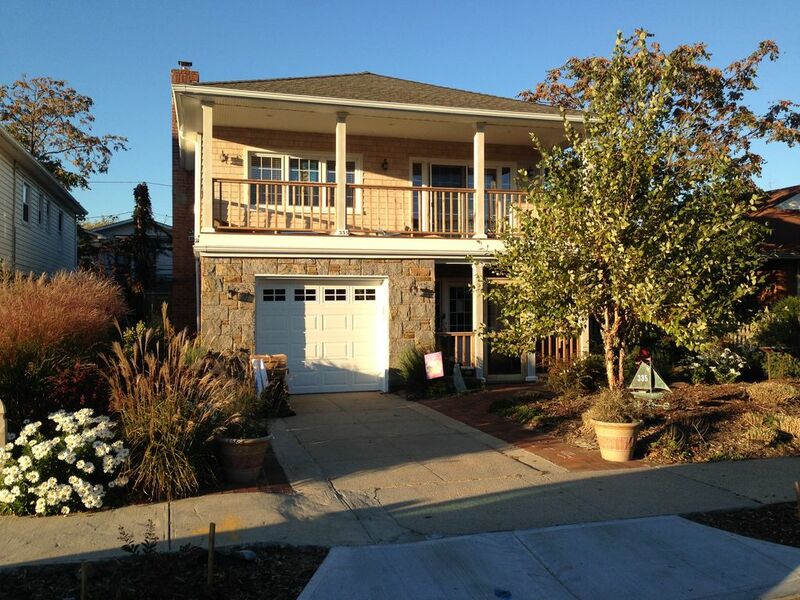 The house is a short walk to the beach and about 10/20mins walk for the LIRR. We used the railroad almost every other day and the service was second to none. Before travelling we arranged a home delivery from Waldbaums supermarket which arrived on time and saved us going out, we also had another home delivery the second week. Other than a few drinks and snacks locally we ate in the City and at home, Michaels BBQ was very useful and as the weather most days was good we made use of it. We took a rotunda trip on the trolley bus which helped us get our bearings, we visited Shines bar in the West End and spent a lovely hour or so chatting to a local man, this is an old bar and was most welcoming, in fact every bar we went to was the same, everyone interested in where we were from, would recommend Pop's Bar on the other side of the bridge too. We did loads in NYC, the new One World Observatory was fantastic as is the 9/11 museum although very emotional, we saw Jersey Boys on Broadway which was so good.....I could go on and on for ever....go to Michael's house and discover how good it is! Thank you for choosing Long Beach! Great beach house!! Spacious and comfortable great location! About an hour to the city, and a few min walk to the beach. Close to the train station and good restaurants. Parking off street. The kitchen has new appliances, a wide range of pots and pans and a well-stocked pantry. The terrace was a lovely place to sun ourselves - when the beach was cold and windy (it has been an unseasonably cool May in NY!). The home is well located - a 5 minute walk from the beach and the new boardwalk and about 15 minutes away from the LIRR train station. Michael provides beach passes, towels, chairs and umbrellas - everything you need for a perfect beach day! We didn't use the grill - as we ended up eating out quite a bit. There were some lovely neighborhood gems a short walk from the house - our favorites were Nagahama (Japanese), Corazon de Cuba (Cuban) and Jordan's Lobster Farm. For groceries - the Waldbaum's near the train station was well priced, with a great selection of produce and deli items. All in all, we had a wonderful time, and Michael went out of his way to make sure we felt welcome and comfortable in his home. I'm looking forward to my next mini vacation to Long Beach, and returning to this property! Deposit required to confirm reservation. Full cash payment required on arrival. Security check ($500) required upon arrival.